See the Maria Chavez Gallery in this issue of eContact! for images and videos of her works and performances. [Daniel Neumann] In one of your bios you state that you “focus on the paradox of time and the present moment, with many influences stemming from improvisation in contemporary art.” But since your main tool is the turntable, don’t all those influences stem from DJ and hip-hop culture? How, if at all, do you position yourself towards this practice and are you often read in this context by others? 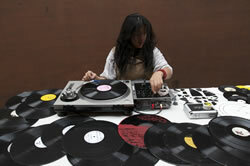 [Maria Chavez] The beginning of hip-hop scratching is not the beginning of turntablism. This practice has been going through a century-long metamorphosis, since the moment it was available for public use. Humans have developed this utilitarian machine and made it into an instrument through curiosity, accidents and experiments. The history of the turntable is a known series of events, peppered with names of sound artists that used it in their works. It’s just the later half of this history that is most celebrated and capitalized on. As far as positioning my work goes, I really don’t feel that my turntablism has anything to do with the DJ hip-hop culture, except for the fact that my first experience with the turntable was under a DJ context. As time went on and I pursued a DJ career, I began to get bored with the parameters that this culture was enforcing. The turntable was a tool for me in a lot of ways. At first with understanding the business of music, then learning the abstract ideas that exist within sound. I can see the phases of my sound life and how one leaned into the next: from a 9-year-old making mix tapes for myself off of the radio, to a 13-year-old trying to write poetry like Patti Smith, to a 16-year-old with a dream to be a famous club DJ, to a frustrated 22-year-old who wanted more out of my DJ experience, and now, to a 31-year-old, looking towards this future, trying to create sound pieces that illustrate the present moment and its relationship with time through improvisation and sound placement. When I look back on how this machine has changed my life, whenever people try to put me in the culture context that you mention, I simply respond that hip-hop isn’t the basis of all turntablism — like English is not the basis of all language. So you relate more to experimental practices — the field around sound art and improvised music — if I understand you correctly. I do now. Before this part of my work even began, I felt as if I had no relation to anything. A painful search for something with meaning, I guess. And here I am, back in the same place some nine years later. [hint] “The turntable just happened to be there.” I think this hits on my feelings of isolation. I never chose the turntable to become my tool with improvisation. David Dove, my first mentor, suggested that I use the turntable because he wanted me to participate in improvisation classes he was teaching. I was a working DJ at the time. The turntable just happened to be the tool that allowed me to explore and understand this world. And now, well, I feel that the stereotypes that surround this poor machine are so strong and growing deeper in the roots of its identity. I can’t shake the stereotype. I continue to be typecast into it, simply because I was searching for a means of understanding the avant garde through it. It’s time to move on and I know it, I just don’t know where or what it is. Second question: The pieces in your solo performances for me are often like little time sculptures. You also keep your pieces very short. Is this sculptural approach to time why you relate more to contemporary art? And how is this sculptural approach related to exploring the present moment? I see this distance as growth. I see this turntable as both an instrument and a tool. It can be both, really, which is why it’s such an interesting object. It was such an amazing experience to grow and develop with this machine. To me, it’s the most forgiving and the most revealing instrument, which makes it easy but difficult to control. Well, while I like this “sculptural approach” description and can see why you see my work this way, I’m not really sure about assigning my sound choices in a fine art term. I wonder why it can’t be called something new? Something that has no relation to anything else that already exists. I don’t know what that is, so I can’t finish this thought, but I know there is something else there. There must be some other way to characterize my work without borrowing from old practices. The preference for short pieces actually has nothing to do with me. When I first started working on the turntable, because I was a working DJ for clubs at the time, I was using two turntables for my performances. The pieces were so long. I was distracting myself from what the moment wanted to say. There was too much to control and manage. Then I decided to only work with one turntable and put myself in a really uncomfortable position and see how much space I can fill with sound. Then when I actually did it, I realized that filling space with sound had nothing to do with improvisation. All of my focus began to develop into left brain, right brain choices. Left hand is on the mixer, managing the EQs and volume, right hand is on the turntable, managing the tone arm, controlling the vinyl. It was only then when I was able to start building an actual vocabulary of sound. That’s where chance jumped in. Objects deteriorate and as a result, new sound opportunities exist. And the rest writes itself. You just mentioned chance, and developing a vocabulary. I see them as separate things. Can you elaborate a bit more on how gaining control over your instrument (building your vocabulary) brings chance into your practice? Of Technique: Chance Procedures on Turntable (2012) is the first book written by sound artist and abstract turntablist Maria Chavez. The interview presented here is actually the Preface of the book. Of Technique is a how-to manual, a book of essays and illustrations by Maria Chavez documenting the past ten years of her abstract turntable practice that was entirely developed through Chance Procedures. This book serves as Chavez’ first object about her sound work since 2004. Available through her website. By experiencing chance situations during performance, this created the basis of developing my vocabulary with the turntable. The more that “went wrong” the more I learned about new sound possibilities, i.e. when a needle broke a certain way it began making interesting sounds on different records. The more they broke, the more sounds began to emerge that wouldn’t have without accidents and damage. And now since I understand where all of those sounds came from and how, I can make them on my own whenever I sense that it is the right moment for that specific sound. Accidents, chance, coincidences, to me, are the root of new beginnings in anything, in this case it was with the turntable. So how do you structure your live performance pieces — now that you have a vocabulary? Are there formal ideas beforehand that you then execute, or how open do you leave the situation for decisions in the moment? And then the second question — and the question with which I would close the interview — is, do you anticipate a point in the future of your practice where chance would run out of possibilities? And where would you want to move from there? I never have a complete structure in my head before a performance. I tend to think about different approaches and ideas throughout the days, listening to the pace of the sounds around me. When it’s time to play, sometimes I will have ideas of what vinyl I want to listen to or which techniques I’m trying to perfect with my hands. Once I sit to perform, I enjoy creating unstable situations, which can be seen as a structure, but the goal is to encourage the present moment to dictate the sound pieces. The beauty of chance is that there will always be new opportunities for combinations of pieces so I don’t believe that running out of possibilities even exists. The big question is where do I move on from here. I am not interested in a following a musical model for my work. I feel that I have reached a point with the turntable where I am moving into the conceptual possibilities of sound within a space. The turntable, in the first decade of my sound pursuits, brought me to this point and I am forever grateful. I love using this machine because it offers so much opportunity and can sound like anything I want it to. But my interest was never in perfecting my turntable technique, but rather understanding this amazing world of improvisation and now how to implement the lessons learned with the turntable into a more expansive context. 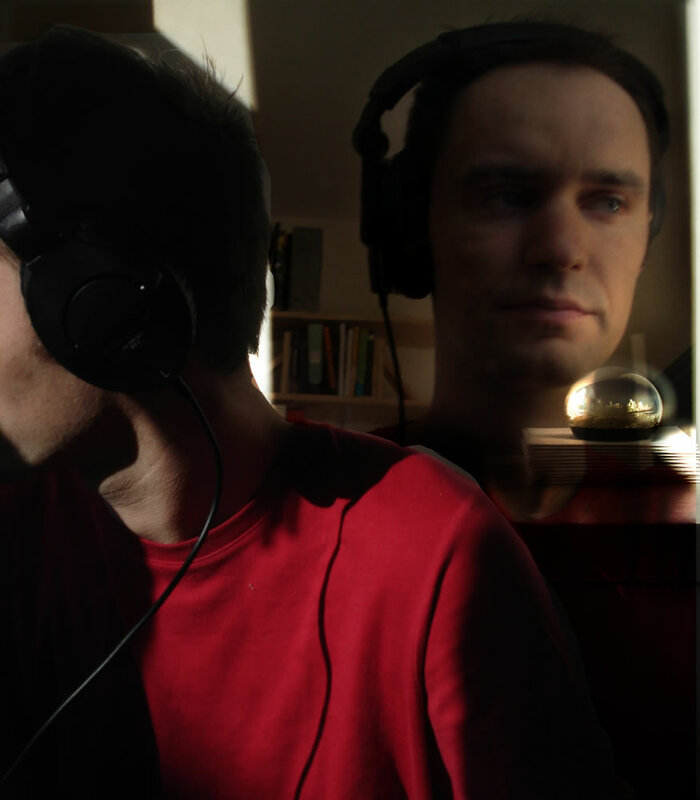 Daniel Neumann is a Brooklyn-based sound artist, organizer and audio engineer, originally from Leipzig, Germany. He holds a Master’s degree in media art at the Academy of Visual Art Leipzig and also studied electronic music composition under Emanuelle Casale. Currently Daniel is artist in residence at Eyebeam Art & Technology Center in NYC, where he continues both — his artistic and his curatorial practice. He is using conceptual and mostly collaborative strategies to explore sound and sound material and its modulation through space and media.